Welcome to our monthly newsletter, filled with all the latest Flipgrid updates and community opportunities. Like something you see? Share with your friends! Wakelet, Merge, Pear Deck, Book Creator, DoInk, Skype, Screencastify, Apple Clips, Insert Learning, ThingLink, 3D Bear, IMG, Quiver Vision, Chatterpix, Adobe Spark, Buncee, OneNote, AND Flipgrid!? Discover the creative power of #Appsmashing from innovative educators and vote for your favorite combo in this year's bracket! All for one and one for all, we are #BetterTogether! 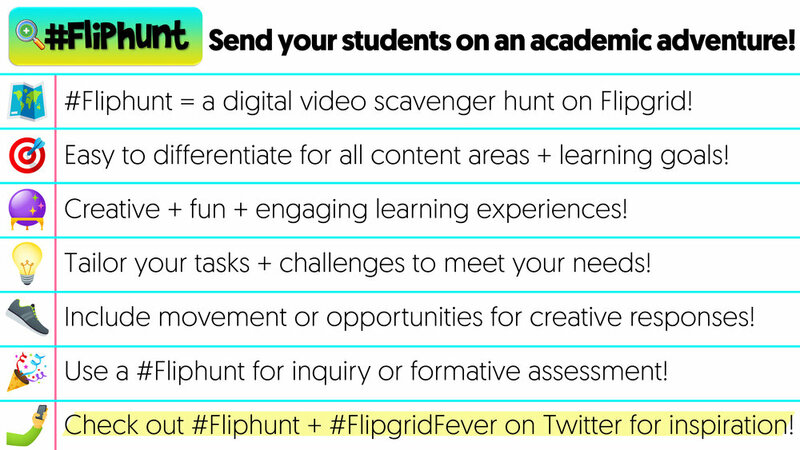 A #FlipHunt is an academic scavenger hunt that gets students moving and having fun as they learn your curriculum. We sat down with the #FlipHunt Founder Kathi Kersznowski to learn how you can bring this engaging experience to your school! 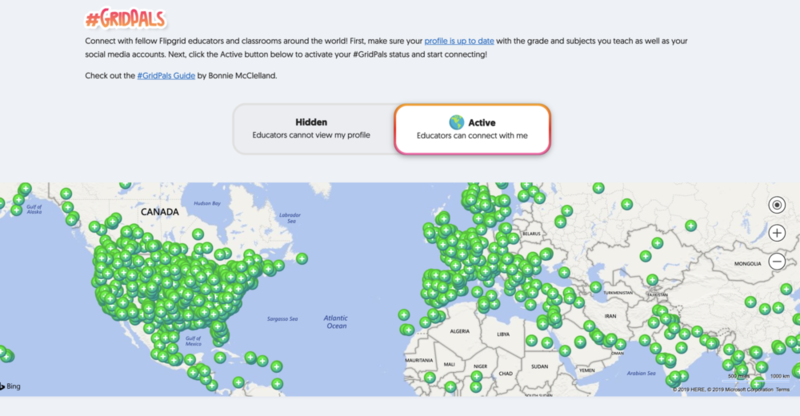 Our first Flipgrid Explorer is back on the Grid starting March 4th! Join Laura G Explorer in this special #GridPals edition of the Flipgrid Explorer Series with the expert herself! Our friend Priscilla Heredia is organizing the experience for you and your students - simply fill out her interest form for more details and to join the adventure! Dive into the Explorer Series! Need we say anymore?! In our next Flipgrid Feature, this inspiring duo will share transformative practices for infusing your curriculum and cultivating an inquiry mindset among your students. Join Holly, Trevor, and your fellow, innovative friends! I LOVED reading to @SuzyQKlagzâ€™s class via @Flipgrid so much that I created my own account! Join our latest odyssey down the West Coast of the U.S. for a journey of #StudentVoice rallies, secret sauce explorations, #FlipgridFever-ella meetups, and a grand finale celebration at Spring CUE. 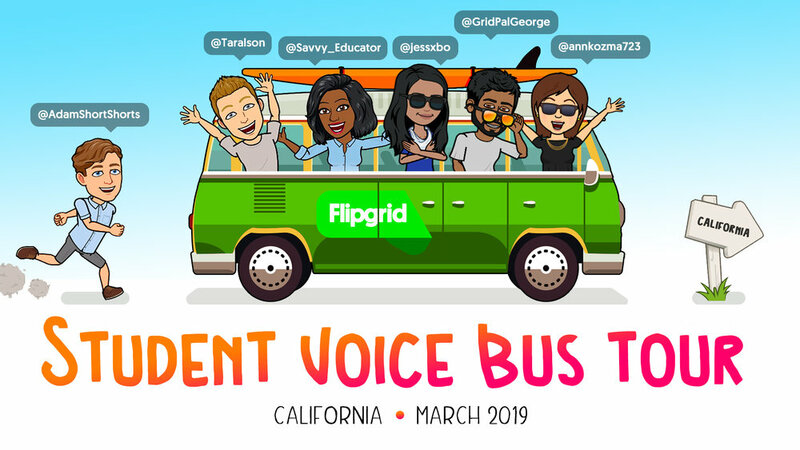 You need not be based in California to hop on the Flipgrid bus: we're bringing you along on Twitter, Instagram, and via our Tour Grid! We are always updating Flipgrid based on the amazing ideas and feedback from educators in this community. Here are five recent updates! ðŸ¤³Craft your perfect selfie by searching our brand new set of stickers, now including emoji! ðŸ—ºThe #GridPals map has been supercharged to help you find your classroom's next great adventure. Tune in to #FlipgridLIVE for our next MAJOR update! ðŸ“±It's now easier than ever to share Flipgrid Responses on Remind! ðŸ‘¨â€�ðŸ‘§â€�ðŸ‘¦Encourage families to stay current on classroom activities by Following a MixTape. They'll receive a notice whenever you add videos! World Read Aloud Day, Read Across America Week, National Literacy Month, and more: every day is an awesome day to celebrate literacy. Jess, Ann, and Jornea, aka the Flipgrid Educator Innovation Rockstars, have congregated a few of the greatest ways, including exclusive Flipgrid content from How To Train Your Dragon Author Cressida Cowell! Celebrate literacy with your learners! Thank you again! We are so grateful to work with you and we are so inspired by the innovative ways you empower and amplify your students. Please continue sharing your amazing ideas, feedback, and questions with us on Twitter and via email - we love chatting!